Obituary for Joseph A. Libecci | Shore Point Funeral Home and Cremation Services, Inc.
Joseph A. Libecci, 84, of Holmdel, New Jersey, passed away peacefully on Thursday morning, March 29, 2018 at Brighton Gardens in Middletown, New Jersey. He was born on July 12, 1933 in Brooklyn, New York, where he grew up. On August 6, 1951, Joseph married his wife, Josephine, and began their lives together, raising their family in Staten Island, New York. He was a proud United States Air Force Veteran, having served our country during the Korean War. Before retirement, Joseph was the Manager at Manfredi Toyota in Staten Island for many years. 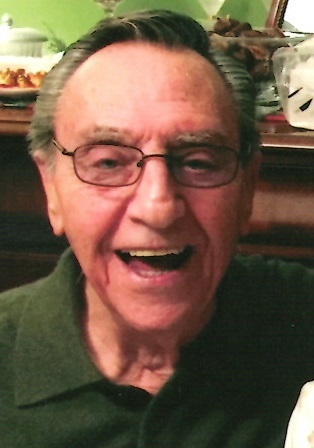 He was predeceased by his parents, Ugo and Concetta (Discepolo) Libecci, his siblings, Dan Libecci, Salvatore Libecci, and Mary Donello, and his daughter-in-law, Beth Libecci. Joseph is survived by his beloved wife, Josephine (Battaglia) Libecci, his loving children, Frances Rizzo and her husband, Joseph, of Middletown, New Jersey, Mark Libecci and his wife, Cathy, of Saratoga Springs, New York, Joseph Libecci and his wife, Angela, of Middletown, New Jersey, and Michael Libecci of Wilton, New York, his dear brother, Salvatore Libecci, and his cherished grandchildren, Melanie Rizzo, Christa, Samantha, Jenna, Michael, Sophia, and Kate Libecci. Joseph will be deeply missed, but never forgotten. Arrangements were entrusted to the Shore Point Funeral Home and Cremation Services, Inc., 3269 State Highway 35 North, Hazlet, New Jersey 07730. In respect of Joseph's wishes, he will be privately cremated. A Memorial Mass of Christian Burial will be offered at St. Catharine's Roman Catholic Church, on Wednesday morning, April 4, 2018 at 9:15 AM, 108 Middletown Road, Holmdel, New Jersey 07733. Entombment of Joseph's cremains will follow at Holmdel Cemetery Mausoleum, 900 Holmdel Road, Holmdel, New Jersey 07733. For information, directions, or to send condolences to the family, please visit, www.shorepointfh.com.